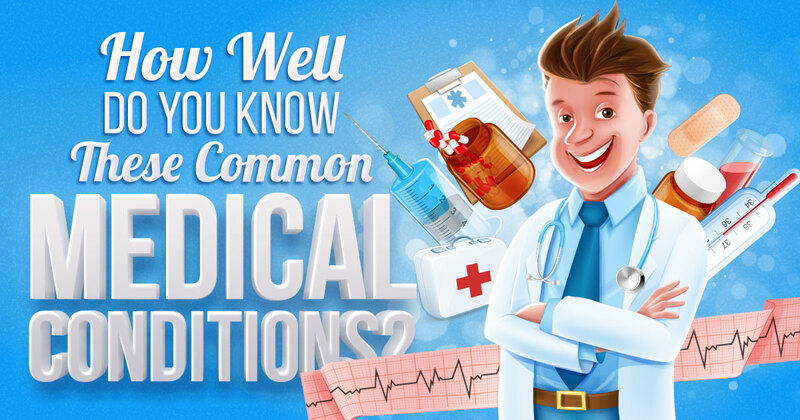 How Well Do You Know These Common Medical Conditions? Put on your stethoscope and get ready to play doctor. Have a go and test your knowledge of common health conditions and diseases with this quiz! Which form of dementia was named after the German neurologist and psychiatrist who identified the first case of the disease in 1901? Your doctor has written 'coryza' on your sick note. What illness are you suffering from? What does OCD stand for? This syndrome results in developmental delays and a characteristic facial and bodily appearance, and was named for the doctor who first described it in the 1860s. What is the name of this chromosomal disorder? A patient has been diagnosed with tinea pedis, also known as Athlete's foot. What causes this infection? On which part of your body would the carpal tunnel syndrome cause a tingling sensation? Which illness was named after the French neurologist who published "Study of a Nervous Affliction", an account of nine patients who were afflicted with the disorder? What is the common name for the medical condition, 'hallux valgus'? What is the name for a severe allergic reaction? What is allergic rhinitis more commonly known as? What is epistaxis more commonly known as? What is tinnitus more commonly known as? Which of these is a common symptom of vertigo? Coeliac disease sufferers have an adverse reaction to this food. What is this food in question? What is bovine spongiform encephalopathy more commonly known as?